Aged in Bourbon and Oloroso Sherry casks, Glendalough Double Barrel is a spicy, vibrant Irish whiskey that flies high the colours of the new generation of Irish whiskeys. Distilled in small quantities, this Double Barrel Single Grain has been aged in two types of casks: firstly in Bourbon barrels and then in Oloroso Sherry casks. A spicy, vibrant Irish whiskey that flies high the colours of the new generation of Irish whiskeys. Rich in black fruits (cherries, raisins and figs) it shows a floral with lemongrass and nutmeg notes. It shows a sweet, creamy mouthfeel with caramel and green pepper, balanced with the sweetness imparted by the Bourbon barrels. A finish marked with ginger and almond paste. 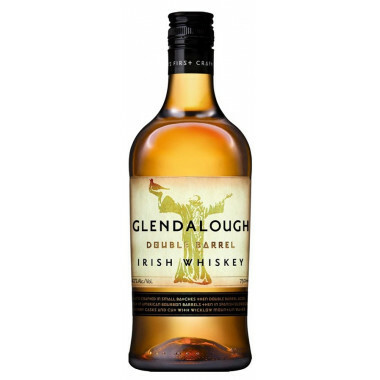 Glendalough has been awarded a double Gold Medal at the San Francisco World Spirits Competition 2015. Nose: slight but undoubtedly rich with dark fruit; cherry, raisin, fig (with Christmas pudding notes on the nose for those lucky enough to know what that is) along with floral lemongrass and a touch of nutmeg. Taste: sweet and creamy on the palate, with butterscotch, honey and peppercorn bringing along sweet Bourbon Cask notes with dried fruit returning through notes of maraschino cherries and a pinch of brown sugar. Finish: lingering notes of ginger spices with a faint glimmer of almond to end a complex Irish Whiskey from start to finish. Double Gold Medal, San Francisco World Spirits Competition 2015.